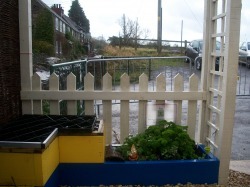 In Spring of 2009, we were offered a small strip of land alongside the Village Hall, on which to build a garden. With the help of local businesses, and lots of volunteers, we built a garden area with raised beds, a pond, gravel, a seating area and a mini greenhouse. We were very excited when our preschool garden build was featured in a three part 'makeover' series in Nursery Education Magazine. You can see the articles below. Many thanks to Nursery Education Plus Magazine for permission to feature these articles on our website. All text and photos are copyright of Nursery Education PLUS/Scholastic 2009.